NYCIntern is excited to announce the addition of a new housing location: Albee Square in Downtown Brooklyn! Albee Square is a brand new luxury apartment building in one Brooklyn’s most up and coming neighborhoods, featuring incredible amenities, spacious apartments, and easy access to Manhattan. We know many interns prefer to have more privacy, so we’re excited to be able to now offer a limited number of private, single-spot bedrooms. Albee Square apartments are all two bedrooms, and interns can choose to share a room or have their own room in an apartment. 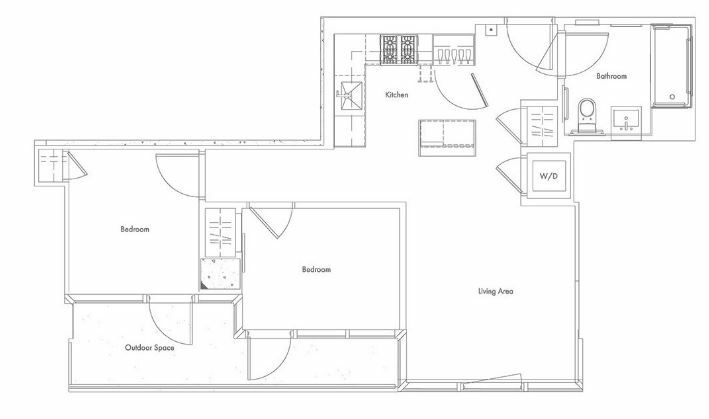 This isn’t a dorm room, but a true two-bedroom apartment, as you can see in the floor plan below. Note that exact floor plans differ depending on the specific unit you are placed in. At Albee Square, you’ll choose a double spot or a single spot in a bedroom (instead of choosing by apartment style, like at our other apartments). There’s room for two unbunked twin beds in each bedroom. Note that if you choose a single spot there will still be two beds in the room. Like other buildings, each apartment will come furnished with four beds, four desks, dressers, a couch, and a dining table. Albee Square also has in-unit laundry, floor-to-ceiling windows, hardwood floors, dishwashers, and central air and heat. Albee Square has 24-hour doorman security, package and bike rooms, and a free gym. Need a place to study or hang with friends? Visit the in-building lounge featuring an outdoor terrace, game room, and business center. Plus, Albee Square has a movie theater and a rooftop with incredible views of the Statue of Liberty and Manhattan. Not convinced yet? Albee Square is less than a five-minute walk to Target, Trader Joe’s, and Dekalb Market Hall. Around the corner, you might just find the world’s best coffee at one of Brooklyn’s indie coffee shops, like Blue Bottle Coffee, Bridge Coffee Shop, Bluestone Lane, and Devocion Coffee. Looking to grab lunch or breakfast on the go? Stop by Renaissance Java Cafe or Casella Bagel Coffee Shop. Have we mentioned Downtown Brooklyn’s thriving nightlife? Enjoy the weekend at Brooklyn Heights Wine Bar, Hollow Nickel, Kimoto Rooftop Bar & Lounge, or Alamo Drafthouse (a super hip movie theater). Downtown Brooklyn has all you need–groceries, wine, coffee, and bagels. Plus, you’ll find yourself in a homey neighborhood that you won’t want to leave at the end of the summer. Ready to move in? Single rooms at Albee Square are $5,500 for the term, and double rooms are $3,500. Note that for Term C (May 19-August 4), and additional $100 is added to the term fee. If you haven’t applied yet, start your application ASAP: spots are filling quickly! Want to update your application to grab a spot at Albee Square? Shoot us an email to make the move. NYCIntern is so excited to offer Albee Square this summer, and we hope you are, too!